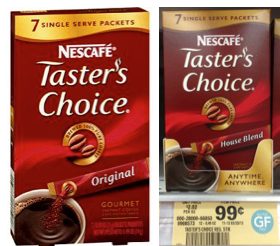 Nescafé Taster’s Choice only $0.44 at Publix! Use the $0.55/1 Nescafe Coupon that is available to get a great deal at Publix! They have the Nescafe Tasters Choice Single Packs for just $0.99 each. After using the $0.55/1 coupon they will be just $0.44 each! Great Price! Check out the rest of the Publix Coupon Match Ups to get all the best Deals! Don’t have Publix in your area? Check the Grocery Price Comparison Tool to find the best deals on this product at your local stores. New Pork Coupon – Save $1! Michelle Feliz Larsen on Dixie Ultra & Everyday Paper Plates Just $1.29 at ShopRite! NJ Pug Mom on Dixie Ultra & Everyday Paper Plates Just $1.29 at ShopRite! Laura D. on 2 FREE + $1 Money Maker on BIC Silky Touch or Twin Select Razors at Walgreens! katherineisabel on 3 FREE + Over $1 Money Maker on Stayfree Pads & Carefree Liners at ShopRite! sl on FREE ShopRite Brand 18ct Large Eggs ! MisterBill on FREE ShopRite Brand 18ct Large Eggs !